Hello Friends! I had some time yesterday afternoon to make a few cards. This particular card is for the Watercolor stamping challenge that my friend Judy is hosting over at the Mod Squad. I had some not so good results initially, so that is why the flowers are layered with pop dots. 😉 You can never have to many flowers on a card now can you? The flowers and leaves and butterflies are SU. The sentiment is one of my favorites from Verve. Categories: Cards | Tags: Card making, Cards, rubber stamps, stamping, Thinking of you, Verve Stamps, watercolors | Permalink. This is beautiful Nancy. Love your watercoloring of the pretty flowers. Great job with the challenge. Well, I love this card. And yes, you can never have too many flowers….lol. Love the cheery bright yellow with the green leaves!! And the splatters are the perfect final touch, as is that sweet butterfly! Great take on the challenge, thanks so much for playing along with me this week at Mod Squad! This is so beautiful and I love the little splatters too! Great colors. Nancy this is gorgeous. Love the splatters and beautiful bright colours. So pretty. This is beautiful… and happy looking! 🙂 Thanks for sharing! 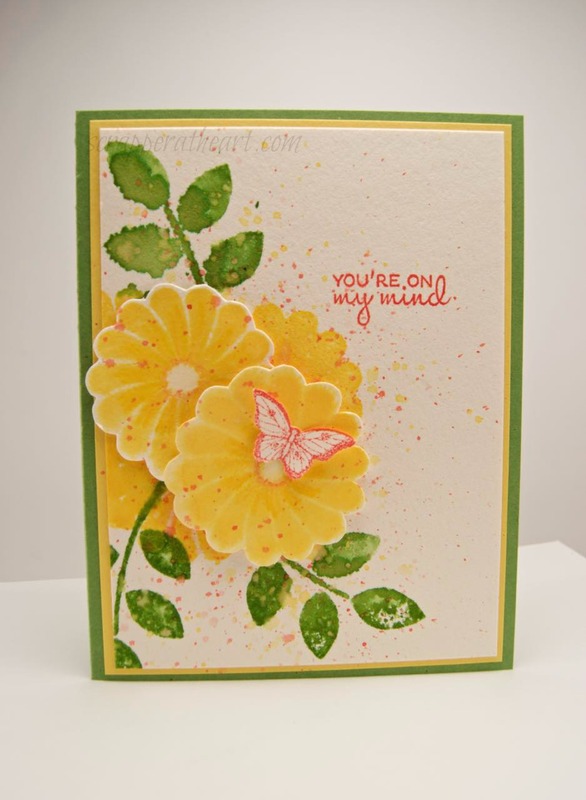 Wonderful watercolored card, Nancy, and I love the little butterfly perched on the flower. LOVE the watercoloring, the colors and the popped flowers! GORGEOUS, Nancy! Too many flowers is never a problem! I love your watercolor blooms and the little splatters you added make it look so artistic. Beautiful!